We are involved in the design, supply and installation of refrigeration equipment (ammonia and freon) for food processing plants throughout South Africa as well as neighboring countries. We listen to our clients needs and requirements, which results in our projects being well designed, coordinated, managed and finished on time. 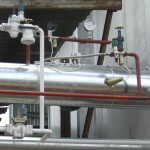 We have a continuous flow of installation and service work in the meat, chicken and dairy industry. We have a dedicated service department that supports our installations which consists of a 24 hour back-up facility with common spares readily available. We are often called into existing plants for general service work, as well as compressor overhaul and future supply of equipment. Hot as defrost NH3	Hot gas defrost on Ammonia 2 ton Gyro. 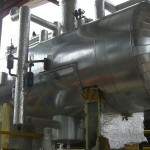 Surge vessels for Ammonia refrigeration.